The City of Campbell River is committed to engaging the growing community of entrepreneurs in the area. 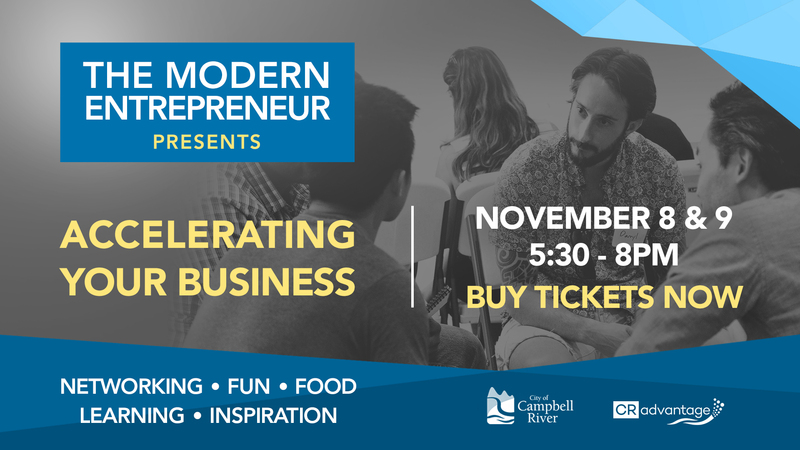 We are proud to be a part of The City of Campbell River’s Modern Entrepreneur Series. Here, you’ll learn how to accelerate your business, prepare for fundraising, and use technology to your advantage. We’re thrilled to meet Campell River’s entrepreneurs, from idea-stage, right up to those looking to raise money. We’re also excited to bring the following fantastic partners together to engage in discussion with the local entrepreneurs. Read more below about how they can help your business grow. BDC is Canada’s business development bank and the only financial institution devoted exclusively to entrepreneurs. They help create and develop strong Canadian businesses through financing, advisory services and capital, with a focus on small and medium-sized enterprises. Committed to the long-term success of Canadian entrepreneurs they understand that a business is more than just dollars and cents. How does a business obtain 100% financing on real estate, equipment, and technology? How does BDC help growing companies maximize their working capital? Learn how BDC’s fintech offering can provide companies like yours with up to $100,000 in financing in 5 business days or less. Are you looking for than an accountant? MNP, believes in being your partner in business. That means offering industry-specific expertise and services that go beyond traditional accounting and tax. MNP’s professionals look at your business from all angles and provide clear, straightforward business advice to help you improve every aspect of your organization. As entrepreneurial firm built for entrepreneurs, MNP combines the strength and resources of a national firm with an on-the-ground understanding of our local economy and business culture that can only be truly appreciated when you live on the Island. How can I structure my business to save taxes? How can I manage the growth of my business? RBC is one of Canada’s largest banks and one of the largest banks in the world, based on market capitalization. RBC is one of North America’s leading diversified financial services companies, and provide personal and commercial banking, wealth management, insurance, investor services and capital markets products and services on a global basis. RBC has over 80,000 full- and part-time employees who serve more than 16 million personal, business, public sector and institutional clients through offices in Canada, the U.S. and 35 other countries. What financial impacts should I consider if my company is growing? What do you look at when you’re evaluating a banking relationship? How do banks evaluate a company when giving loans? Futurpreneur Canada has been fueling the entrepreneurial passions of Canada’s young enterprise for two decades. We are the only national, non-proﬁt organization that provides ﬁnancing, mentoring and support tools to aspiring business owners aged 18-39. Futurpreneur Canada makes it easier for aspiring young business owners to secure financing. Futurpreneur has partnered with the Business Development Bank of Canada (BDC) to extend our support to you even further. We offer collateral-free loans at better interest rates than most banks. But we can’t do it alone. We’re able to finance up to $15,000 per business. If you need more money, BDC may provide up to $30,000. As the regional driver for accelerating business success through scientific innovation and technology, Innovation Island supports technology-based companies to accelerate their growth. Based in Nanaimo, Innovation Island plays a vital role in building the technology ecosystem in the mid and northern Vancouver Island region. As the leading voice for technology entrepreneurship and innovation in the region, our goal is simple: support entrepreneurs to start and grow successful technology companies. Provide them with the resources, expertise, connections and opportunities they need to grow and stay in place. If you are an entrepreneur in Campbell River, join us for two days of insight and networking. Seats are limited!